Majoring in music at Occidental College in Lost Angeles, Cathy originally planned to be a symphony clarinetist and music teacher. After doing that for awhile, she decided that medicine would be a better profession, and put music aside to be a doctor and medical school professor and mother. In 1985, she gave her husband Jon an autoharp (after all, anybody can play autoharp) to accompany songs in his role as a cub scout leader. Jon never really bonded with the autoharp, but Cathy got it out of the closet and started playing when she heard Bryan Bowers at a folk festival in 1988. She has performed and taught at festivals and workshops nationally and internationally for 25 years. Cathy won the International Autoharp Championship at the Walnut Valley Festival in 2005. She wrote the popular beginner’s book “It’s An Autoharp!” in paper and digital form, and also Autoharp for Kids, using a color-coding system. Cathy is the 2012 inductee into the Autoharp Hall of Fame. She enjoys many musical genres on the autoharp, including Celtic, Scandinavian, and American traditional music, modern folk, blues, and rock. She has written a number of waltzes which have become popular in the Seattle dance community. One of Cathy’s greatest loves is harmony singing, and she enjoys playing autoharp while singing in duos, trios and larger ensembles with friends, and loves teaching people how to find harmony lines. 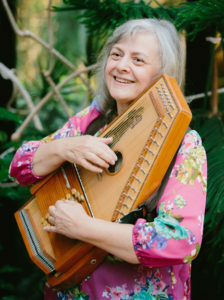 Cathy sees the autoharp as a wonderful instrument to sit and play quietly as a solitary form of meditation, to share wonderful times with friends, or to make the music that inspires people to dance.